I think I may have departed from my edgy aesthetic and started leaning towards my boho roots again. 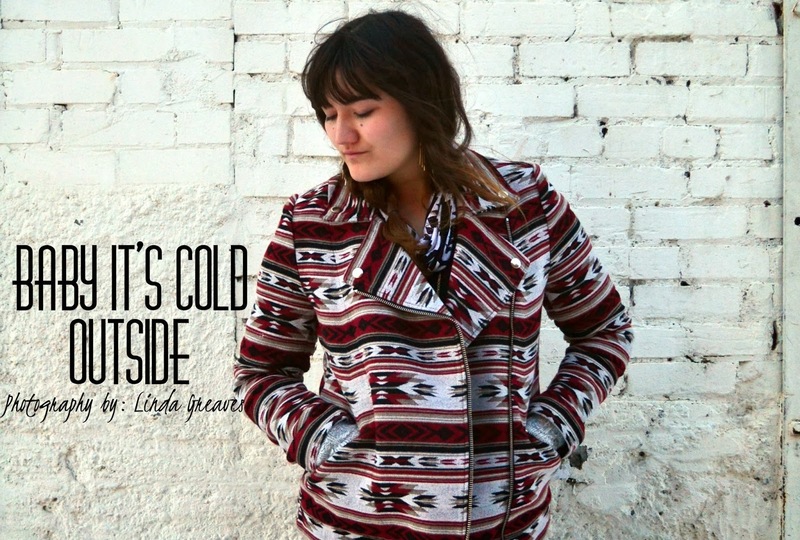 I've accumulated quite a few tribal print items recently, and this coat from Forever 21 is a new winter favorite! Along with that, this adorable infinity scarf from Shop Lately! It's so cozy and the perfect little neck warmer for those chilly walks across campus. So I've decided these Oasap heart tights are my favorite find this year. I'm definitely treating them delicately, since I think I'd tear up if they tore. Thankfully, they're holding up so far! They garner so many comments/compliments! One guy in my Design class asked me if they were part of the tight's design or if I'd glued the hearts on! Haha, another girl said they looked like tattoos. I love the reaction I get to them - they're just so different from what's worn around here! I've also received some pretty gems from Shop Lately, in the form of these stunning fringe earrings and dreamcatcher necklace. Whenever jewelry makes a statement, I'm automatically drawn to them. Normally I won't pair them together, but I feel like these pieces worked together well in this outfit. I had a lovely surprise at work the other day, when one of my regular customers came up to me at my counter and handed me a wrapped present. It was a Christmas mug filled with candy! It was such a pleasant gift to receive, and I can't believe someone I met through work would be so thoughtful. Tis the season, my lovelies! Cool outfit Linda and I love your accessories! I am loving that printed coat! This jacket! I'm absolutely in love. I really need to get my hands on a printed jacket because I just love what this adds to the outfit. I don't blame you at all for being obsessed with these tights; they're awesome! Speaking of awesome, so is this necklace. Basically just everything, as usual haha. Love this look so awesome. Oh Linda, Linda! I have missed you so. Things are much better now and medical help for our ailing family member was just the right thing, (HM daughter). So we can now have and enjoy Christmas. That scripture is my all time favorite! Yes, we need to love like Him in order to be able to receive His love! You are so inspiring, my friend! You are much wiser than your years! Adorable use of bright blue in the almost-winter season! I love this whole outfit, actually -- it's very relaxed yet chic. And you brought my favorite tights back! and, um, that would be an adorable idea for a tattoo -- little hearts around the tops of your knees, like the tops of some cute socks. :D thanks for inspiration! You are so adorable! I love your outfits! I also like how you include a bible verse at the end of your posts! I am trying to figure out how to follow you on bloodspot! You got a present from a customer?! Now that's a wonderful world to live in, I don't think I've ever gotten any gifts from 'my' customers. :) Anyhow, yes, those tights are frigging adorable, maybe you should get another pair in case these get ruined. Stunning outfit! Perfect for winter ;) great job! Aaaaw, lookatchu, makin' all these cute little friends wherever you go!~ u 3u haha, that's too lovely! Have a great week, Linda, my sweetums! that scarf is so pretty! I love it! And I love how you ended this post... great verse! Fabulous outfit, love the earrings so pretty ! this outfit is so cute! I really love the tights and your earrings! I love the outfit sweetie! Especially the earrings! Very gorgeous on you! Love your scripture verse. The blue skirt is perfect with all your lovely jewelry. Amazing outfit, pretty lady! Love the accessories and the royal blue skirt. I can't get enough of your jacket! This is really pretty and cute! Again, the heart tights...swoon! Adore the trendy tribal vibe of this fantastic outfit, the jacket is so eye-catching and the scarf is so pretty. 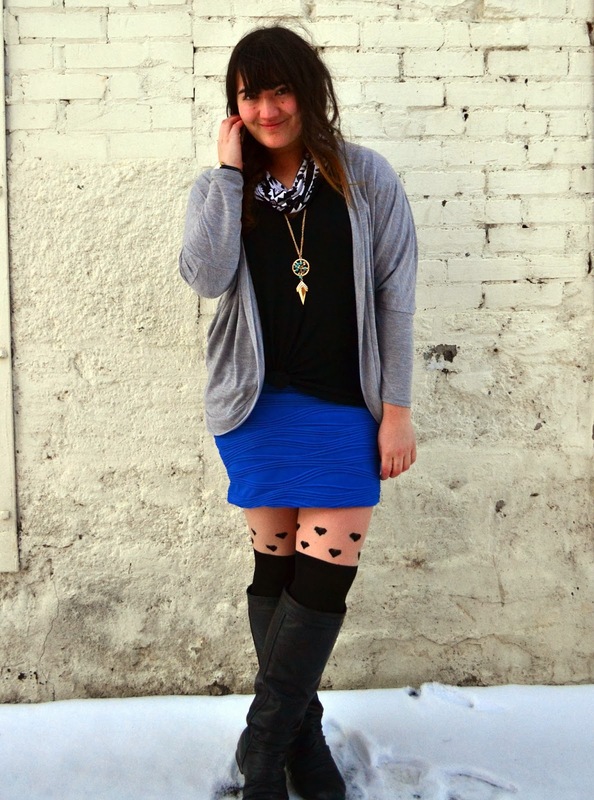 The heart print tights are adorable! Nice jacket! I like the print! Aww that's so sweet a customer gave you that gift- I'm always super pleased with candy ;) And even though I'm pretty much the reincarnation of I Love Lucy with my closet, I sometimes can't help go for a boho vibe every now and then. It's just so gorgeous :) And I LOVE you tights- so quirky! i'm loving your fringe earrings Linda!! i like how you incorporated the pair with your ensemble!!! i like the infinity scarf too!!! the outfit is so chic for winter!! i love every detail of it!! The boho style really suits you! I am in love with this gorgoeus jacket! 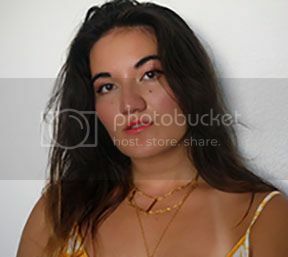 Love the blue on you and your necklace! I love how you mixed tribal prints in this outfit.. there's a lot going on but it all works super well together! I love the tribal biker jacket here, the print is awesome!! such a cute look. LOVE the tights! This jacket is just beyond fabulous. Everything about it is perfect, from the fabric to the colors to the print!